UPDATE: The Oral B 4000 toothbrush has been discontinued by manufacturer. Please check out my reviews of Oral B 3000 and Oral B 5000! The Oral B 4000 toothbrush (its full name is ‘Oral-B Healthy Clean and ProWhite Precision 4000’, previously known as OralB Professional Care SmartSeries 4000, in Europe sold as Braun OralB Triumph 4000 Four-Mode Power Toothbrush) has been available in the market for quite a time now. However, it still remains to be one of the most popular choices for a rechargeable toothbrush. It features an advanced cleaning action that helps keep your mouth clean and healthy and also whitens your teeth. Click here to learn more on Amazon.com! OralB ProfessionalCare 4000 uses rounded brush heads are specifically designed to remove plaque from your teeth and gum line, even from the deepest areas of your mouth, improving the overall condition of your mouth. It is important always to remember that this toothbrush (as well as almost all other electric brushes) is waterproof and it is absolutely safe to use in the bathroom. Equipped with an advanced cleaning technology, the Oral-B Professional Care SmartSeries 4000 provides a deep mouth cleaning action leaving you with a cleaner and healthier teeth and gums. It provides 40,000 pulsations and 8,800 oscillations per minute to give the best possible cleaning within the two minutes required brushing time. Added to that, this rechargeable toothbrush includes a Floss Action Brush Head, which is designed to remove all plaque between your teeth and gum line thoroughly, and even those in the hard to reach places. With this, you can achieve professional-like teeth and gum cleaning. Using the SmartSeries 4000 brush, you can get whiter teeth in just a matter of three weeks. You can use the whitening brushing mode to help you get rid of your teeth stains, revealing their natural radiance. You can also opt-in just replacing your brush head with the ProWhite Brush Head (with a polishing cup) that can also remove teeth stains for whiter teeth. This is an excellent option, especially if you need to use other brushing modes rather than whitening. This toothbrush comes equipped with a Professional Timer. This timer beeps every thirty seconds to remind you that you should move to the next quadrant of your mouth. It also keeps you on track of your brushing time by playing the long sound when the recommended 2 minute brushing time is up. If you are using the Deep Clean mode, the brush beeps every 45 seconds and emits the long beep after 3 minutes. The timer does not switch the brush off so you can keep brushing even when the recommended time is up. The SmartSeries 4000 takes into account that every user has different dental needs. So to cater to each and everyone’s oral care, it comes with four brushing modes. BTW you can quickly find out the number of brushing modes from the Oral-B toothbrush model name – OralB 4000 has 4 modes, OralB 3000 Pro has 3 modes, and Oral B Pro 1000 has only one mode. When the toothbrush is switched on it automatically starts in the Daily Clean mode. Oral B 4000 features a separate button for mode switching. If you want to switch to another mode, you have to press the Mode button repeatedly. The modes are in following order – Daily Clean -> Sensitive ->Whitening -> Deep Clean -> Daily Clean. You can see the selected brushing mode on the toothbrush handle display. 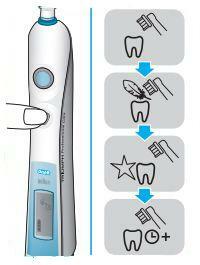 The fully charged Oral B 4000 toothbrush can be used 20 times (2 minutes each time). That means you can use it for 10 days without additional charging. In other words, if you are leaving your home for 7-10 days, it is safe to leave the charger at home. The charging process takes more than 10 hours if the battery is totally empty. But usually, a 15-minute charge is enough to for one 2-minute brushing. The display in toothbrush handle has 3 segment battery symbol that shows the current battery status. OralB ProfessionalCare 4000 toothbrush is bundled with one Oral-B Floss Action brush head, but it is not the only compatible brush head model. You can also use Oral-B Pro White, Oral-B Sensitive, Oral-B Precision Clean, Oral-B Dual Clean, Oral-B Power Tip, Oral-B Ortho, and Oral-B Braces Care Essentials replacement heads and even an Oral-B Tongue Freshener. Pressure Sensor – for more effective brushing techniques, this rechargeable toothbrush has a pressure sensor feature that tells you if you are brushing too hard. Its pulsations stop whenever you are applying too much pressure while brushing. Indicator Bristles – bristles fade halfway to remind you that you need to replace them. You should replace the brush head every 3 months. Brush head alert – this feature gives signals to remind whenever you are just ten days away from needing to replace the brush head. Charge Level Display – this feature indicates how much charge is left to your toothbrush. The SmartSeries 4000 box size is 3.4 x 7.8 x 7.2 inches, and it weighs around 1.3 pounds with all bundled accessories. With its compact size, this toothbrush can easily be stored wherever you want and is very portable for traveling. Actually, there are no unique accessories for this toothbrush model. The only item I can imagine you would want to get is a UV sanitizer for sanitizing the brush heads. I should say that this product does very well and can be considered to be one of the best toothbrushes available at the moment. It is also important to note that many customers have given this product lower ratings (even 1-2 stars) because of issues not directly related to this product quality or performance. As an example, at one point manufacturer made a mistake of shipping similar but older model (9000-series OralB Triumph) in OralB 4000 boxes. As a result, several customers who ordered this toothbrush, in fact, received the old 9000th model packed in current OralB 4000 model box. Instead of getting in touch with the seller and arranging the replacement, many customers went online and gave low ratings to the product itself. Users give this product an above average rating when it comes to cleaning and keeping teeth and gums healthy. However, the toothbrush’s design is only on the average. The design is not entirely on the wrong side, but it is certainly not the best. The toothbrush handle is a little bit bulky compared to other rechargeable toothbrushes, so it is a little harder to pack in whenever you go for a travel. The rubberized handle can slip out of your hand, especially if it is wet. Altogether, SmartSeries 4000 gets a high recommendation from users since it highly performs on teeth and gum cleaning. Most, if not all, users attested to its mouth cleaning capabilities. They felt the difference between using a rechargeable toothbrush compared to manual. After using SmartSeries 4000 toothbrush, they can really feel that their mouths cleaner and teeth are whiter. People also liked that it came with a timer since it keeps them on track of their brushing time, especially for kids. The rounded brush heads are commendable as they really can reach on those deepest areas. Though the SmartSeries 4000 really works for mouth cleaning (which is its primary role), it has still some product flaws. Some people find the rubber grip to be flimsy as it can easily fall out of their hands, especially when wet. People also find the unit’s handle to be a little bulky, compared to other rechargeable toothbrushes. Many also find the brush heads to be small, so it is a little uncomfortable to brush. If you have a bit more money to spend you should check out the OralB 5000 toothbrush which is quite similar to the 4000 model but has 5 brushing modes and external timer. You can read more about the differences between these models in the next chapter. Another model worth checking out is the new OralB 7000. If you think that Braun Oral B brush heads are too small for your teeth, you should check out Philips Sonicare toothbrushes. 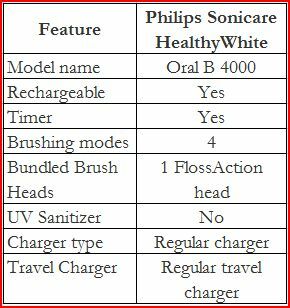 The 4 mode model from Philips that can be compared to Oral B 4000 is the Philips Sonicare Flexcare. When people are shopping for a higher-end power toothbrush, they are inevitably coming across the two top brushes from OralB – OralB 4000 and 5000 models. These two brushes look so similar that it may be hard to understand their differences. You can find more about the differences in this review – Oral B 5000 and 4000. If you are shifting from manual toothbrushes to this one, the price may shock you a little. The OralB 4000 often is purchased along with replacement heads OralB Floss Action 3 pack brush head refill and Oral-B Pro White Replacement Brush Head (3 ct.). Some people are buying this toothbrush together with Waterpik Ultra Water Flosser. You can read more about water flossers HERE.